When a patient starts orthodontics in our office, they are given an Orthodontic Care Kit which contains samples of all the items they will be using during orthodontic treatment. It will contain an instruction pamphlet, a travel toothbrush, dental floss, floss threaders, interdental brush, and ortho wax. 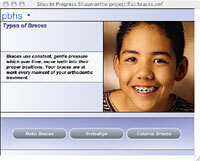 Our staff will train each orthodontic patient how to care for their braces. It is very important to brush your teeth regularly during orthodontic treatment to keep the teeth and gums healthy during and after treatment. Brush your teeth and gums 3 to 4 times per day with a soft toothbrush, after every meal and at bedtime. We will supply you with a travel toothbrush for brushing after lunch at school. Daily flossing with floss threaders is also recommended. This can be done at any time of the day or night. Pick a time of day that works best for you. Sit down at a table or desk with a make-up mirror or mirror with a stand to make it more comfortable and visible. Also make the process better by listening to music or watching TV while you are flossing. You will also be instructed in how to use an interdental brush for cleaning in between your brackets. This will be important to use because there are many more areas that are susceptible to decay while you are wearing braces. We recommend that our orthodontic patients rinse with a fluoride rinse (such as ACT Fluoride Rinse) daily. When you get your braces on, you may feel general soreness in your mouth. Your teeth may be tender to biting pressures for three to five days as they adjust. If the tenderness is severe, you may need to take Ibuprofen (Advil or Motrin) or Tylenol to help you feel comfortable. The lips, cheeks and tongue may also become irritated for up to two weeks as they toughen and become accustomed to the surface of braces. You can put wax on the braces to alleviate this discomfort. Don’t worry if teeth start to loosen during treatment. This is normal and is to be expected throughout orthodontic treatment. The teeth must loosen first so they can be moved into their new corrected position. Once the teeth are moved, they will again stabilize into their new positions.